Kurt Angle has had a long career in wrestling. On this week's episode of WWE RAW, the WWE Hall of Famer came out to the ring to announce his future in the ring. He said that he was done with wrestling and that he would be wrestling the last match of his career at this year's Grandest Stage of them all, WrestleMania 35. A true legend of WWE, Angle has been one of the best parts of wrestling history in the Attitude Era and the Ruthless Aggression Era. A role model in every sense of the term, Angle has never really had a 'bad' match in his career. Prior to making his debut in WWE, he had a career as an amateur wrestler, winning Olympic Medals while wrestling with a broken (freakin') neck. The Superstar is a legend in every sense of the word and has wrestled and taken on every top wrestler in the company in his heyday. He also had an incredible run in TNA, which many consider as the best part of his career in wrestling. Angle had issues with his neck throughout his career, and recently the issues stopped him from actively participating in the ring. Kurt Angle came out to the WWE ring on this week's episode of WWE RAW to announce that he was finally wrapping up his career with the company. After having performed with multiple issues and injuries for most of his life, the WWE Hall of Famer finally decided to call it quits. He said that he would wrestle his final match on WrestleMania 35, after which he would retire. On WWE RAW, he took on Apollo Crews in what will be his final match in his hometown of Pittsburgh, Pennsylvania. He was able to win, with the help of an Angle Slam. 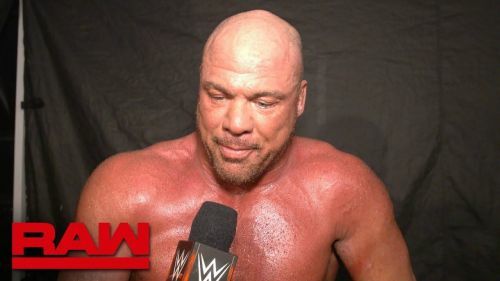 Kurt Angle did not specify an opponent for his retirement match at WrestleMania, although it could very well be someone like McIntyre or Baron Corbin -- both of whom Angle has feuded with recently.